Would Algonquin Park be the same without its trees? Bringing firewood from home to the place you’re camping could put your favourite campsite and Algonquin Park in danger. Firewood often contains insects and plant diseases that can put Algonquin Park's native plants and animals at risk. Campers who bring firewood from home may accidentally spread those insects and diseases could threaten Algonquin Park and beyond. Help prevent the spread of invasive insects. Don't move firewood! The Smith family goes camping and packs an unwanted guest. Don't bring other plant products to Algonquin - The movement of infested plant materials such as nursery stock, trees, logs, lumber and wood or bark chips poses the greatest risk of spreading invasive insects to uninfested areas, like Algonquin Park. Learn the invasive species and symptoms - Learn the signs and symptoms of infested trees and report any issues to the Canadian Food Inspection Agency or Algonquin Park staff. 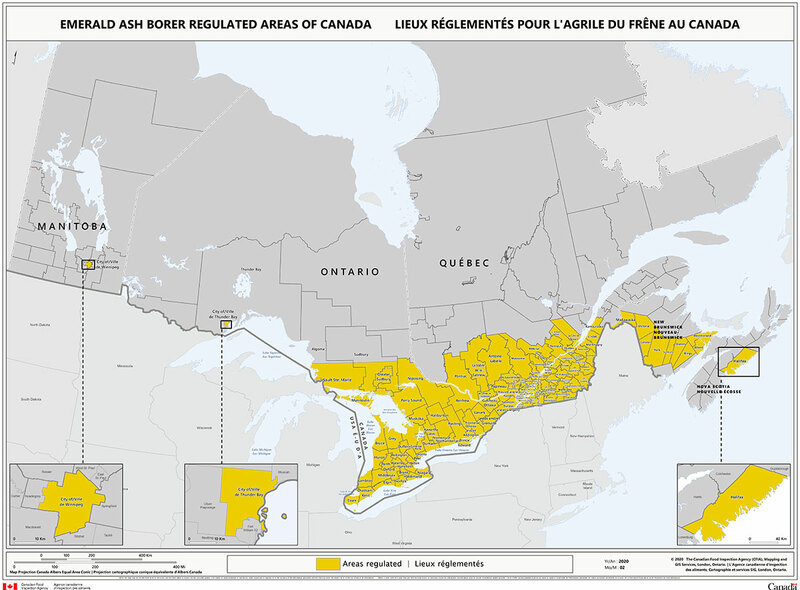 Know the rules - Quarantine areas have been imposed which prohibits the movement of plants materials including firewood in many areas of Canada and the United States (see below for details). Ontario Parks will continue to prohibit campers from bringing firewood from any regulated areas into Algonquin Park (or any provincial park). Anyone moving firewood from a regulated area or transporting within southern Ontario area will have their firewood seized upon entry. Upon departure from Algonquin Park please leave behind any left over firewood. This will stop the spread of any unwanted pests. Local firewood is available for sale at your Algonquin Park developed campground office. Please protect Algonquin Park and its vast forests. Don't move firewood! 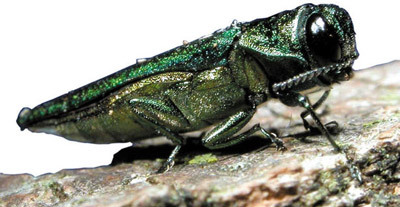 Even though these invasive pests aren't in Algonquin Park, let's keep it that way. Would Algonquin Park be the same without its trees? A regulated area for Emerald Ash Borer exists in much of southern Ontario and also in the greater Ottawa area (see below for details). The Asian long-horned beetle (Anoplophora glabripennis) is a forest pest native to several Asian countries that attacks and kills a wide range of hardwood trees, including maple. This destructive wood boring insect was found in an industrial park in the City of Vaughan in 2003. It is a serious threat to the forests of Ontario. The beetle is no stranger to North America. It was first found in New York in 1996, in Chicago in 1998, and in New Jersey in 2002 and again in 2004. It was likely introduced into North America by way of wooden pallets, crates, or packaging materials used in shipping. Millions of dollars has been spent to eradicate the insect. Though these programs have been successful to date, any new sightings require immediate action. The Asian Long-horned Beetle would be especially damaging to Algonquin Park given the high percentage of forest cover dominated by maple.